Exquisite setting in the park offers generous portions on a something-for-everyone menu. Top choices: meaty crab cakes, slow-roasted pork loin, banana tres leches cake. Moderate to expensive. Tuesday 4-6pm: $5.50 local draft beer, Prado wells, house margarita, lounge chardonnay, cabernet, strawberry margarita, sauvignon blanc, Spanish blend wine, Prado mule. $4-$8 appetizers, $9.95 desserts. Wednesday 4-6pm: $5.50 local draft beer, Prado wells, house margarita, lounge chardonnay, cabernet, strawberry margarita, sauvignon blanc, Spanish blend wine, Prado mule. $4-$8 appetizers, $9.95 desserts. Thursday 4-6pm: $5.50 local draft beer, Prado wells, house margarita, lounge chardonnay, cabernet, strawberry margarita, sauvignon blanc, Spanish blend wine, Prado mule. $4-$8 appetizers, $9.95 desserts. Friday 4-6pm: $5.50 local draft beer, Prado wells, house margarita, lounge chardonnay, cabernet, strawberry margarita, sauvignon blanc, Spanish blend wine, Prado mule. $4-$8 appetizers, $9.95 desserts. Monday 11:30 a.m. to 3 p.m.
Tuesday 11:30 a.m. to 3 p.m.
Jan. 13, 2008 @ 1:06 p.m.
A gem in the middle of Balboa Park, I love walking around the koi pond and ending up in the Prado for some tasty soup and salad. Aug. 20, 2008 @ 6:57 p.m. This is a super place to go after a day at museums--or before a show at the Old Globe-- Be sure to check out the 'happy hour' specials in the bar--You can make a perfect dinner from the menu choices--lovely rolled tacos, fantastic fries, and/or other lighter and tasty favorites. Great value! We also love the dining room specials and have enjoyed several appetizers in place of a main course--the food is delicious! Enjoy! 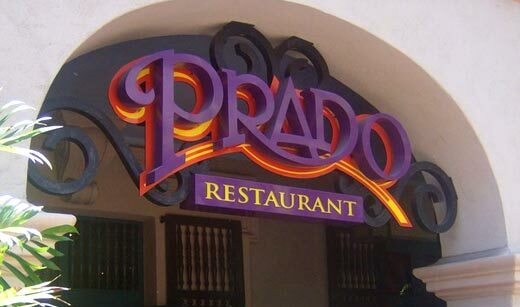 March 12, 2009 @ 12:09 p.m.
Prado has great food and a classy atmosphere. My boyfriend took me there for my birthday dinner and it couldn't have been any better. We started with the Trio of Skewers. Three different meats, each with their own amazing dipping sauce. Each meat could stand on its own to make a fantastic dish. He ordered Lamb and I ordered Steak - both perfectly cooked with great glazes and tasty original sides. To top it off the waiter, who had been really attentive and gave great food suggestions all night, brought out a birthday carmel flan with lit candles and all. I typically don't like Flan because of the texture but this flan was more like a cheesecake and tasted amazing. It was a great birthday dinner and I can't wait to go back.